Just prior to remodeling the "atomic ranch", the incandescent light bulb was issued a delayed death sentence by an act of Congress. Updated 4/25 added Cree CR6. I love the way incandescents look, they're cheap, easily dimmed and - when needed - warm a room. Based on what I've read, the 100W is first to go, then the 75, 60 and 40W. Several types of incandescent lamps, appliance bulbs, three-ways, decorative etc. are exempt. But for the most part, lighting for general illumination using conventional incandescents is doomed. I don't like the way CFLs look. They're ugly, with warm-up delays and low yellowish-looking output at cold temperatures. IMHO CFLs are a transitional technology. I also didn't want to spend a fortune on light fixtures designed for incandescent lamps that cannot be replaced in the future. I decided to explore LEDs. My reasons weren't because it's "green." There's probably more embedded energy in a PAR-38 LED lamp's aluminum heatsink (extracted from Bauxite using lots of kW/h) or in the power to heat the semiconductor diffusion furnace to make the LED die than it will ever save in consumption. I just wanted something that looked good. Curious, I bought some of the Sylvania/Osram PAR-30s and PAR-38's from Lowe's. I liked the Sylvania in particular because, from the outside, they appear to be single-chip light engines. Most of the PAR-series I had seen were multi-chip and looked like giant shower heads as you looked into the lens. The Sylvania PARs didn't look so funky. Just for fun, I built a temporary three-headed cluster to illuminate the fireplace chimney. I really liked the way the light looked. It was very clean and a white 3000K. I also tried using them as down lights using just bare sockets as my "fixture" and they worked very well. Based on the positive results with the PARs I decided to explore LEDs for general overhead lighting as well as the "eye-ball" wall-washers I was going to use on the doors. The PARs in this photo are a mixture of PAR30s and a PAR38. Lowe's only offers the 25 degree beam spread version in 3000K. I want to try 40 degree beam spread to get wider pools in the down lights. My next concern was: "What replacements are out there for the generic 75W Edison base 'A19?'" This lamp is quite easy on the eye with a nice 3000K color. Unfortunately the radiation pattern looks just like the lamp's lens: It's a glowing "snow-cone." At 430 Lumens it will take 4 of these to brightly light a bedroom or office. I also tried the 2700K "60W." (LED12A19/DIM/F/927) It's an entirely different lamp that's a sickly pink. I returned it and bought more "40W." Stay away from the Sylvania 60W. Two 430 Lumen A19s don't produce enough light for a flush-mount or semi-flush ceiling fixture. It's almost impossible nowadays to find a light fixture (designed for incandescents) that have four sockets. I think UL must have banned them for incandescent use due to heat. With four LEDs, the ~32W of heat dissipation is not an issue. 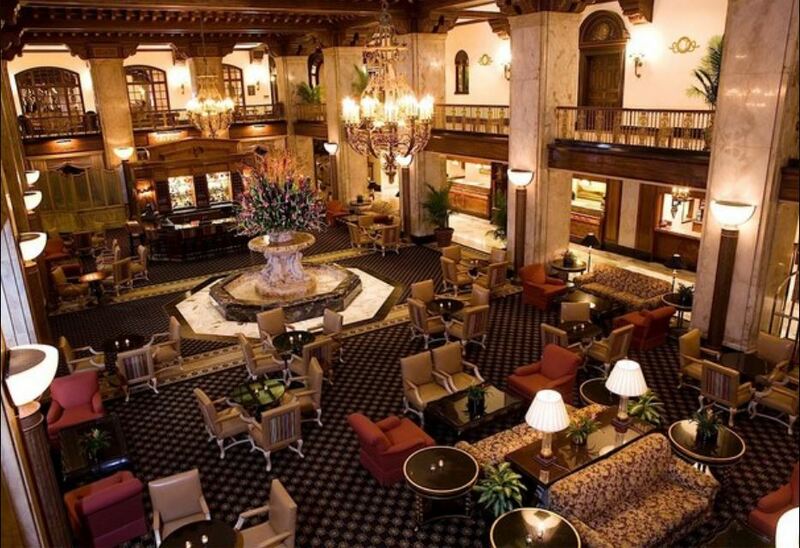 Unfortunately fixture technology and style have not caught up with LED technology. They're still stuck in an incandescent/CFL rut. I think I don't want to use this just because everyone else is. Now this is what I'm looking for. It's the Cherry Tree design L218. You won't find anything like this at Home Depot or Lowe's. And, if you do get lucky it will be lamped for fluorescent circuline or G-series. 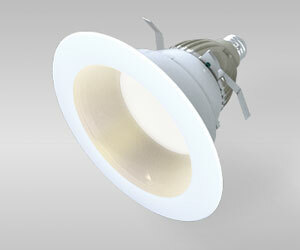 This fixture has two sockets to meet UL approval for use with incandescents. Fixtures with four sockets simply cannot be bought in the year 2011. I had to make them out of parts using quad socket clusters and canopies from Satco. The cool light fixtures will have to be modified. The Satco 90-464 cluster with separate canopy. I'll show completed retrofit fixtures later in the thread. Experiments showed that four of the Sylvania "40W" lamps at 430 Lumens (each) provide sufficient light for an average size bedroom. As I researched A19 lamps also I ran into the GE "62180" also available at some Lowe's locations and online. This lamp showed a lot of promise based on the literature but initially was made with unobtanium. They don't block the almost conventional-looking glass envelope. I think this lamp uses remote phosphors. The radiation pattern is almost spherical. Finally I got some GE 62180s via UPS. This lamp is cool! 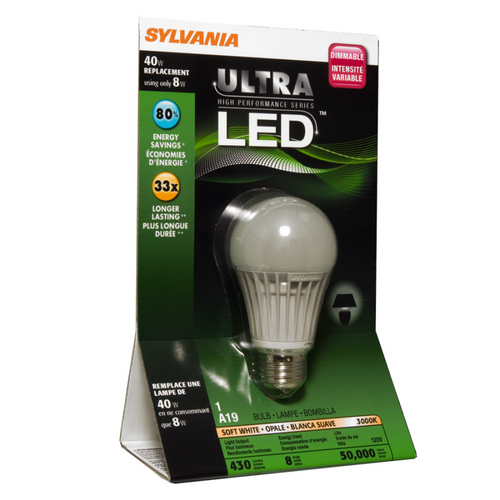 Though it's rated about the same Lumens as the Sylvania "snow cone" it just looks brighter. The radiation pattern is as near incandescent-like as there is. In this GE photo, the GE 62180 (right) is compared It's compared to a "conventional "LED. I think I've bought about ten of these so far. Unfortunately, they're not readily dimmable. But they look really, really good in a number of applications. I've used them in table lamps, hall lighting and overhead fixtures. The GE 62180 is 3000K and very, very clean. The Philips, when off, looks very weird. The packaging has a note on that says "white light when lit." In use, the Philips does look 2700K white. The light output is quite even, rivaling the GE. The Philips is also rated 800 Lumens. The best application I've found for the Philips Ambient LED is table lamps. I haven't measured it yet, but this lamp has the highest base temperature of any LED I've tested, including the PAR38s. Philips claims this lamp is dimmable but I wouldn't recommend it. In a semi-flush overhead fixture I still preferred the 40W Sylvania "snow cone" and GE 62180. I needed an MR-16 LED for my wall-washer cans. These really needed to be dimmable. Some LEDs dim well, some don't at all. The particular can I wanted to use were "magnetically" ballasted e.g. they had a transformer. This MR-16 dims and does so very well: If you chose the right dimmer. I wish all of the LEDs I tried work as well as the Sylvania MR-16. This lamp rocks! The MR-16 wall-washers are aimed at the partition doors. 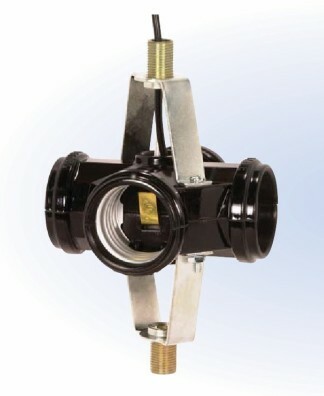 The fixtures are magnetic low voltage using 120:12V 4A transformers designed for MR-16 halogen lamps. They are on two circuits, one for when the door is open and revealed and the second for when they are closed and back-lit. Without dimming, the back-light would have been too bright. This is also a very nice lamp with very nice dimming characteristics. Dimming LEDs are not as easy as it may seem. Incandescent lamps are easily dimmed because they are a resistive load. Halogen lamps, which are also resistive but typically low voltage, can be dimmed, but prolonged operation at low light levels causes premature failure. At low operating temperatures the tungsten that boils off doesn't return to the filament. Halogen lamps can be dimmed, but they also need to be run at full power to recover. Low voltage halogen power supplies ("ballasts") are either "magnetic low voltage," "MLV" (transformer) or "electronic low voltage," "ELV" (switching power supply). Dimming low voltage Halogens requires knowing what type of power supply is used. For MLV supplies the load is inductive with a DC resistance. For ELV supplies the load is capacitive, usually a bridge rectifier followed by a filter. CFLs (or CCFLs) and LED lamps present loads similar to ELV ballasts. Using LEDs in the existing wiring and dimming infrastructure presents unique challenges. At the time I purchased the first LEDs I picked up a Lutron DVCL-153 dimmer designed for CFL and LEDs. With the Sylvania PAR lamps the DVCL-153 caused flickering. The Sylvania MR-16's also flickered with the DVCL-153. In addition, the MR-16's were being used with transformer MLV light cans. MLV dimmers differ from conventional dimmers due to the DC load presented by the transformer. Conventional non-MLV dimmers produce potentially asymmetric waveforms with un-even timing of the positive and negative half-cycles of the waveform. MLV dimmers are designed to be more accurate and reduce the DC component. DC flowing in a transformer can form large currents and can damage and overheat both the transformer and dimmer. They also hum when DC is present. The DVCL-153 is NOT and MLV dimmer and could produce as much as 4-5 VDC in the transformer primary. In addition the waveform asymmetry caused flickering. But why did it flicker? Most LED controllers have no high-side input bulk capacitive filtering the way an ELV supply for Halogens - or any other switching power supply do. For one, there's just no room in an MR-16 for an electrolytic capacitor and most A-series retrofit lamps. Even if they're able to squeeze one in, the life of the cap would be far less than the light engine or solder joints. It's just too hot in there for a large cap on the high side primary. Most LED lamps work on a cycle-by-cycle basis with no significant filtering. The MR-16 form-factor also has to work on DC in order to be retrofitted into ELV ballasts. Take a look at a typical MR-16 supply from Maxim. 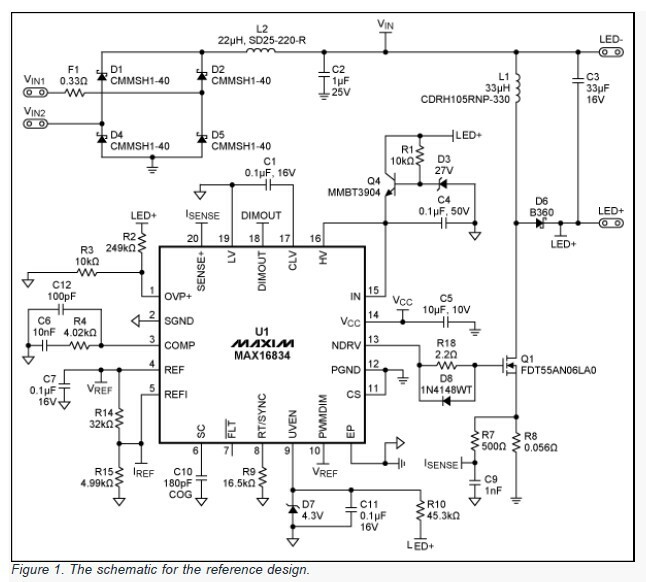 It doesn't say whether this reference design is for an external supply or not. Squeezing that 33uF in the base of the MR-16 on the output must be a challenge. The Sylvania MR-16 may not even have that. Some quick experiments led me to believe that the flickering was caused by the dimmer having un-equal on/off periods for each half-cycle. Since I couldn't immediately lay hands on an MLV dimmer, I improvised. Wow, what a difference in performance some full-wave rectification and filtering could do for the Sylvania MR-16. Now, the lamp could go from full black to full on with NO flickering or pop-on at any level. Using DC, the MR-16 performed even better. With each new LED lamp I tested I checked them for DC dimming performance, Variac (voltage variable transformer), non-MLV and MLV dimmers. Some lamps are synchronous and don't work on DC. Almost all will Variac dim to some degree. Many will dim well on MLV dimmers. Few dim well on the DVCL-153 dimmer designed for LEDs. I'll return to which lamps dim and which won't. 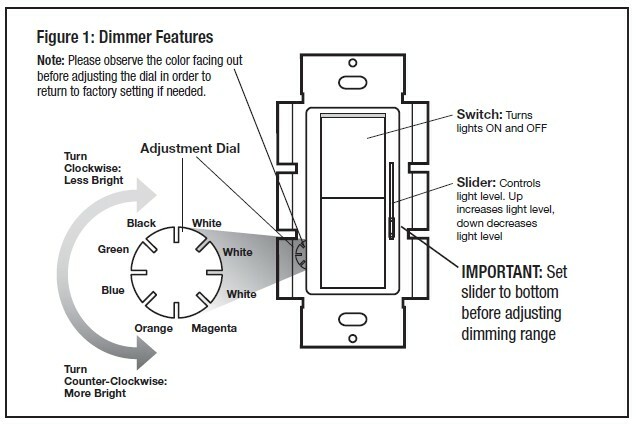 First, a quick review of dimmers. Sylvania has a dimmer compatability chart. The Lutron DVCL-153 is designed for LEDs and CL lamps but it doesn't work that well with most of the LEDs I've tried. It is not an MLV dimmer and makes most LEDs flicker. The PAR-series and MR-16 have "pop on" with this dimmer. It also has poor rejection from adjacent dimmers. The only home I've found for the DVCL-153 is on the four socket cluster using the Sylvania "40W" LED8A/DIM/F/830 lamps. In this location it works well. The one unique thing the DVCL-153 does having going for it is a low-end trim. If the DVCL-153 were made in an MLV model it would work very, very well. The DVLV-600P MLV dimmer works well with most dimmable LEDs I'm using. 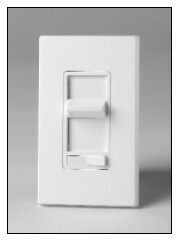 MLV dimmers typically do not allow full cut-off, but the low end range is acceptable. No MLV dimmer I've tested has a low-end trim. This DVLV-600P worked well with the Sylvania PARs (LED15PAR30LN/DIM/830/NFL25), the Sylvania A-series (LED8A/DIM/F/830), and the MR-16 (LED6MR16/DIM/830/NFL25). I ended up using it on the MLV MR-16 wall-washer cans. I recommend the Lutron DVLV-600P or the three way DVLV603P. The 6613 is a three-way switch and available in single pole. 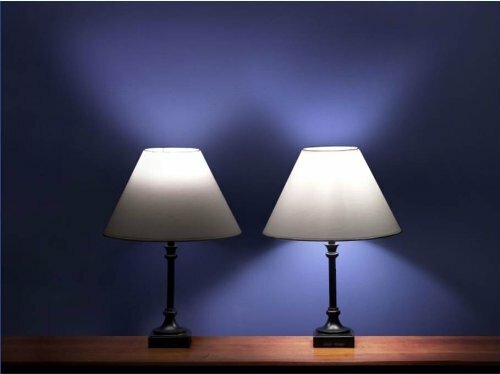 LED dimming often requires matching the dimmer to the lamp. Many lower end dimmers flicker with LEDs. The 6613 is a magnetic low voltage "MLV" dimmer designed primarily for use with transformer loads but it seems to work quite well with Sylvania PAR LEDs. Testing showed that MLV dimmers worked better at reducing LED flicker due to their more precise phase control. Non-MLV dimmers often produce highly asymmetric waveforms when dimmed (with more voltage on one side of the waveform) causing the LED to flicker on alternate half-cycles. Before installing the Leviton 6613 I tried the Lutron Diva DVCL-153. 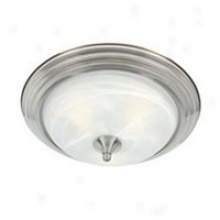 The DVCL-153 is specifically made for LEDs and CFLs and features a low-end preset trim under the cover. The DVCL-153 is not an MLV dimmer. Unfortunately, the Lutron DVCL-153 flickered and was also interfered by other DIVA MLV dimmers in the wall box. The adjacent dimmers were on a separate circuit and there was no shared neutral. I replaced the Diva DVCL-153 with the Leviton 6613. The Leviton 6613 worked flawlessly with Sylvania/Osram PAR-30 and PAR-38 LED lamps. The 6613 has good low end dimming (though not to full black) with no "pop-on." When switched from both the dimmer or alternate "three way" switch, turn-on at all levels was consistent. The low-end dimming performance is the best I've seen. Although the 6613 has no low-end preset it does not appear to need it. There was also no adjacent dimmer interference with the 6613. The load was 2X PAR-30 (15W each) and 1X PAR-38 (18W). I highly recommend the Leviton 6613 when paired with the Sylvania LED PARs. With other lamps "your mileage may vary" but the 6613 would be my first choice for tests. I tried a Leviton 6615-POW ELV dimmer that I found at Ace Hardware. With the Sylvania PAR-30/PAR-38 cluster the ELV dimmer seemed to have less range than the MLV 6613. ELV dimmers require a neutral connection because they begin to "forward" conduct at the beginning of each half cycle, e.g. at zero crossing, rather than on the "reverse" trailing edge of MLV and "tungsten" dimmers. My experience has been that magnetic low voltage dimmers are the best bet for dimming retrofit LEDs. What's needed is an MLV dimmer with a low-end trim. Which Lamps Can Be Dimmed? The Sylvania MR-16 has one of the best controllers. The MR-16 form factor, with its 12V input must have provided the controller designer a lot of opportunities. For one, it's 12V and has to operate off of AC or DC. MR-16 dimming can be done from approximately 7-12V DC. This lamp will go to full theatrical black with absolutely no pop on when operated off of DC. It's AC Variac performance is just as good. I don't have any PAR-20s, but the PAR-30 and PAR 38 Sylvania Lamps dim very, very well on MLV dimmers such as the Lutron DVLV-600P and Leviton 6613. Mine are on the 6613 Sure Slides. The lamps do not go to full black, but a comfortable (and practical) dim level without any pop on can be achieved. The PAR-30 and PAR-38s have a nice controller. For whatever reason, the 6613 (and 600P) both seem to sense how low to dim without causing cutoff. The Leviton 6613 seems to be the best at this. Full Black: N, but darn close. As good as MR16. The second runner-up for dimming performance is the Sylvania A-series 40W. This lamp also operates off of AC or DC and appears to have some bulk capacitance and persistent phosphor. It's every bit as good as the MR-16. 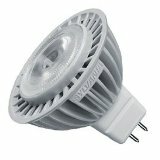 The GE 62180 is not electronically dimmable. The Philips 60W lamp can be dimmed, but it's low-end performance is limited and it eventually starts flashing. For a snow cone-style lamp very, very good. I've got four of them in the office overhead on the Diva-153 dimmer. All around the best light engine. Looks good in anything. If married to the controller in the Sylvania products this one would be the bee's knees. This lamp is funky in a number of ways but damn, it's sure pretty in a table lamp. It's also the most efficient at 64 lm/W. Also the hottest with a heatsink temperature of about 122 degrees F.
Triac MLV Dim: N, due to flashing at low end. 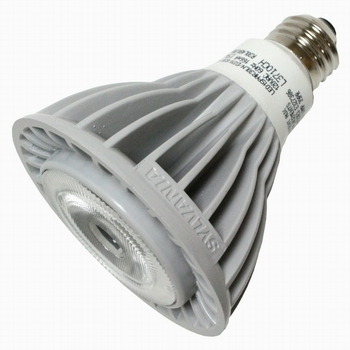 13W 800lm 61.5lm/W (The second most efficient lamp and a virtual tie with the Philips). Some light fixture pictures, undercabinet lighting and power study for the house will follow. The cost of LEDs vs. the lighting kW/h saved may not ever provide a payoff based on what I paid for them as Mr. Early Adopter. I am however finding that the power bills have started seeming unusually low even running the LEDs 24/7. The power savings, in Watts or VA are very real. 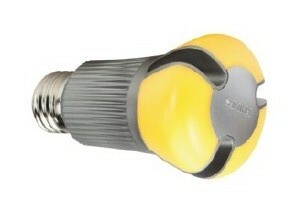 A hidden advantage of this bulb is its highly efficient thermal management system. With operating temperatures at 50% less than Halogen bulbs, this bulb not only saves on lighting energy costs, but also reduces air conditioning costs due to the drastic heat reduction. Validated testing has conclusively proven that for every 1 watt of light energy saved, a 1/2 watt of secondary air conditioning savings is also achieved. After living with the four socket clusters I've decided that the Sylvania 40W snow cone lamps are going to make me go blind. For whatever reason, the GE62180 lamps just appear brighter despite the fact that the output, in lumens, are about the same. Four of the GE62180 light a 12x16' room adequately. The GE 62180 kicks a**. The Sylvania just isn't bright. The search for the "perfect" A19 replacement continues but for right now GE holds the crown in A-series. Unfortuantely, Lowes no longer sells the GE 62180 at around $35 each. Grainger and Amazon have them for about $50 each. Today I found the GE62180 on Target's website for $40. Though I'll gladly trade dimmability for the ability to actual see, I'm going to try to find a simple way to load the dimmer. The GE 62180 doesn't have enough Triac holding current to satisfy any dimmer I've tried it with though it dims quite well on a Variac. The Philips is still growing on me for table lamp use and it looks quite good in the Cherry Tree Designs Yellowstone 2 socket fixture. The color is quite amber and for general illumination four lamps are required. You are in deep. I appreciate all the data! Hope I remember it's here when I need it. I expect more and rapid change in this area. What will lighting look like 20 years from now..? not my problem I don't expect to be around and/or doing house wiring that long. I just checked the Energy Star website and the GE 62180 is the only A-series to make the list. I kinda wish the 62180 wasn't an Energy Star lamp. If it were not Energy Star, it would probably be dimmable. The cost of triac holding current is about 2W of "wasted energy" I recall reading. As I mentioned earlier, four of the 40W Sylvania snow cones just aren't bright enough. Today while shopping at Lowes I found the Utilitech (Feit Electric) LA19DIM/800/LED which is a 60W 800 lumen 3000K. I'm impressed. These babies dim very well, are bright, and don't have an odd color. Note that the Lowes online product image is incorrect. FWIW We love the GE 62180s more than ever despite their non-dimmability. Finally, Lowes has come to thier senses and started stocking it again. These bulbs are only about twice the price of a halogen that lasts weeks to a few months. Now that there is a bulb that puts out decent light, both in terms of spectrum and brightness, I'm ready to buy a hundred of them. Just wish I could get them in one box. Thanks for the update Waveterm. My Lowes sold out of those 60W Feit A19s a few weeks ago and I have not seen them since. Glad you found some. The A19 40W Feit's seem to still be available. On the upside Lowes seems to have good stock of the GE 62180. Those and the Philips are beautiful in table lamps. The GE is also quite good in overheads. I've been using four of the 60W Feit's in my office on a DVCL-153 dimmer the last few weeks and am quite happy with them. They are far brighter than the ~400 lumen Sylvania they replaced. The 40W Sylvania wound up in my Luxo-lamp style bench lights. SMT laser-marked part numbers were almost impossible to read with 75W GE Reveals. With the LED lamps, the laser-marked part numbers literally pop off the part. The commercial lighting distributors which would have the Feit in bulk packaging seem to be behind the curve. Lowe's and Home Depot are at the forefront. I've filled several recycling bins with hard plastic clamshells which packaged retail "green" LEDs. 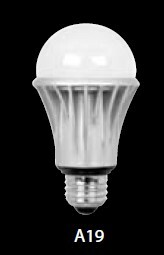 Lowes and Home Depot have product: Dallas Light Bulb delivery has only heard of LEDs. It's a missed opportunity. One thing people seem to be unaware of are the life-reducing aspects of dimming halogen lamps. Though they are longer life at full power, the life is significantly reduced, sometimes to less than 1000 hours, when they are dimmed. In order to get incandescent efficiency up to the standard, manufacturers are working hard to introduce Halogen replacements. Unfortunately, in almost all of my applications, the lamps are dimmed. In my house the Halogens would be less efficient than the standard A19s they replace. There's also this Light=Heat thing burned into my psychology. With it 105 degrees here every afternoon for the last month or so one becomes conscious of excess heat in the form of lighting. I see a light on, want to turn it off because its' "heating the room," and then I realize that "wow this thing is only burning 9W and I can't feel any heat from it." The Light doesn't equal Heat thing has taken some getting used to. 9W is still more than you want to hold in your hand,,, but a huge improvement, for the hot summer months.